As low as possible without buzzing. That's the general request by most of us musicians, who really don't want to be working harder than necessary to mash the strings down to the frets. After all, we're repeating those left hand maneuvers over and over, sometimes hours at a time. 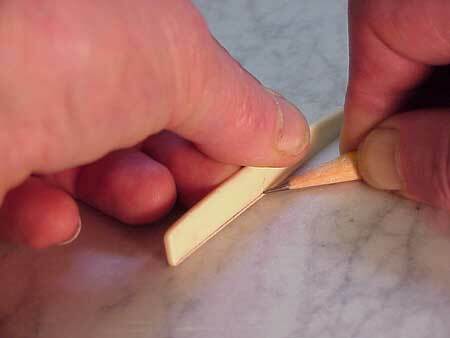 A few thousandths of an inch can spell the difference between success and tendonitis. 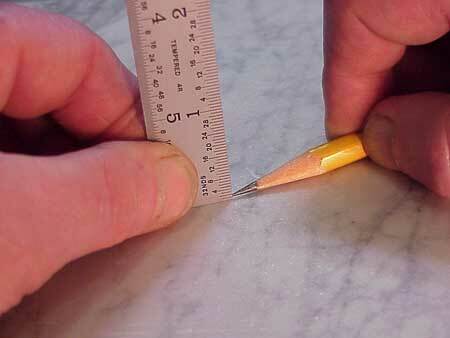 One of the biggest problems in setting up your guitar is that there are no really concrete measurements. Sure, there are factory standards, but those can't take into account that we all differ in our needs. The way you hold a pick, the volume at which you play, the scale length, the gauge of strings, and many other factors influence the performance of your guitar. So, at least to some extent, it would be advantageous if you could make adjustments in action yourself, so you wouldn't have to take your guitar to the shop for small incremental changes. While most of the adjustable bridges weren't as clunky as this Dove's Tune-A-Matic bridge, they all impaired tone more than we were willing to tolerate. So much for user-friendly action adjustments. But, if you are stout of heart and at all mechanically inclined, you can make some of your own action adjustments without getting into too much trouble. 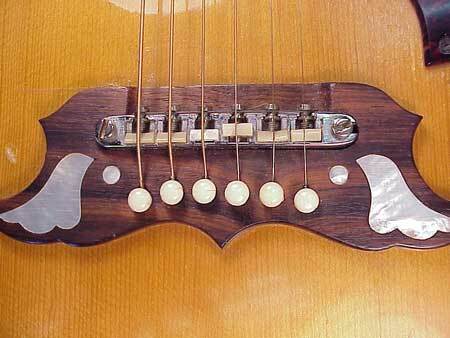 If your guitar has a pickup with an element under the saddle, you might want to reconsider making your own adjustments. 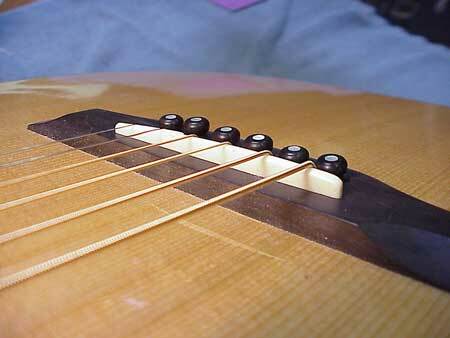 It is relatively easy to mess up the saddle-to-pickup contact and/or damage the element itself. 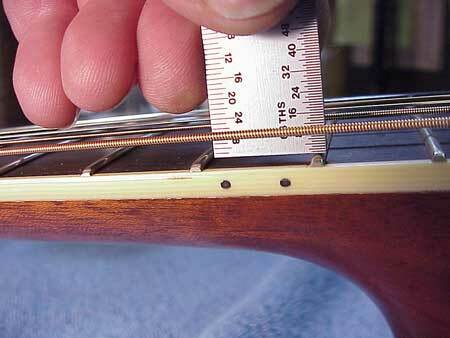 As I write this article, I'm assuming you have read over some of my earlier pieces on truss rod adjustment, bridge and saddle configuration, and neck angle diagnosis. If it seems as though I've assumed too much, don't forget to gaze through some of the articles you'll find on the big Index Page. As guitars age, the action generally rises. The top bows upward, the upper "shoulders" rotate forward a tiny bit, allowing the neck to pull up a bit. That's why most of the time, adjusting action means lowering action. If there's very little saddle sticking up above the surface of the bridge, you may need to consider whether it's time to reset the neck or whether it makes sense to cut the wooden part of the bridge lower in addition to lowering the saddle. I hope I've gotten all the "caveats" out of the way by now. 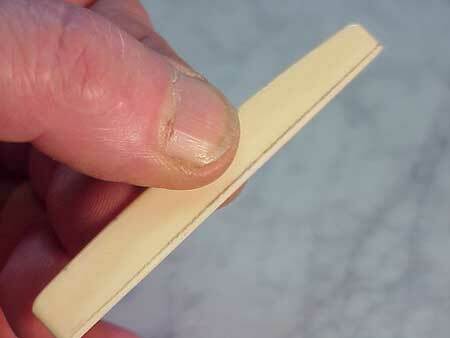 Here's a general procedure for lowering the action on an otherwise healthy guitar. This instrument, by the way, is a Santa Cruz model H.
As a rule, I try to work with 1/64" increments when adjusting the action. In this case, I'd like to lower the action to 7/64." 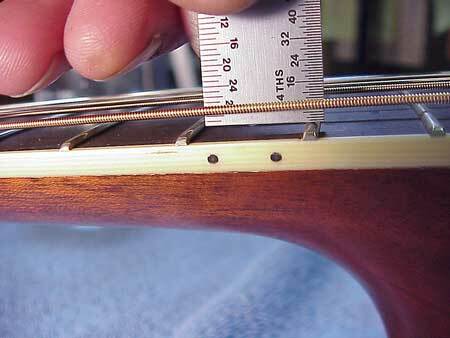 If the action is to go down 1/64" at the twelfth fret, then I must lower the saddle by 1/32." A simple piece of trigonometry leftover from high school! That's it. 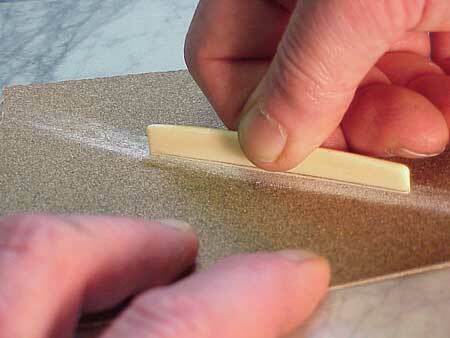 As soon as my line is sanded away, I can replace the saddle. And, my action will be right at 7/64." Now, the action under the first string happened to need to be lowered by just the same amount, so my measurement was easy. If I wanted to lower the action more under the bass than the treble, I'd have drawn my line at the appropriate angle.